Like the creation of any good strategy, the process of developing an innovation strategy should start with a clear understanding and articulation of specific objectives related to helping the company achieve a sustainable competitive advantage. This requires going beyond all-too-common generalities, such as “We must innovate to grow,” “We innovate to create value,” or “We need to innovate to stay ahead of competitors.” Those are not strategies. 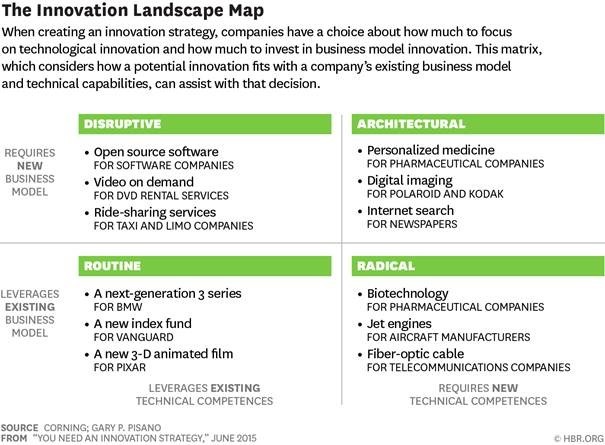 They provide no sense of the types of innovation that might matter (and those that won’t). The crowdsourcing idea is that rather than relying on a few experts (perhaps your own employees) to solve specific innovation problems, you open up the process to anyone (the crowd). One common example is when an organization posts a problem on a web platform (like InnoCentive) and invites solutions, perhaps offering a financial prize. Crowdsourcing has a lot of merits: By inviting a vast number of people, most of whom you probably could not have found on your own, to address your challenges, you increase the probability of developing a novel solution. Low Cost—The first group focuses on having lower production costs, and thus lower prices, than their competitors. Their business models are predicated on efficiency, which becomes the foremost priority for producers. Customer Intimacy—The second group strives to form close relationships with their customers. This gives them advantages in areas such as quality and service. Best Product—The third group takes a product leadership position. Their competitive advantage stems from their creative skills, emphasizing and pursuing quality design of products that satisfy customers’ unmet needs. They distinguish themselves from the aforementioned groups by going to greater lengths to meet customers’ needs. Anyone—without preapproval or vetting or criteria—can create and contribute. In fact, it is crucial that they do. Recent research (http://dl.acm.org/citation.cfm?id=1862443) of 166 science challenges involving 12,000 scientists shows that novel ideas come from “marginality”—a source of different perspectives and heuristics, play an important role in performance. This idea inclusion— across ages, genders, geographies, cultures, sexual orientation, and all the other ways in which new ways of thinking can manifest —is essential for solving new problems as well as integral in finding new solutions to old problems. The element starts with celebrating each human and, more specifically, something Nilofer Merchant recently termed “onlyness”. Onlyness recognize that each of us stands in a spot that fits only them, and is a function of history and experiences, visions and hopes. That unique point of view is the genesis of new ideas, the ones that challenge the status quo, or improve upon the existing condition. The more traditional formulation of the source of ideas was considered “talent”. Talent, however, was often credential-dependent. We relied on gates to determine just whose ideas were worth considering as valid contributions. Now, it is more commonly accepted that actual capability can come from anywhere, because each of us is standing in a spot no one else stands in, a function of our history and experiences, visions and hopes. And from that place, we create: not because of our accolades but because “we” see something no one else can see. Thus onlyness is an advancement on the idea of talent. Oftentimes, talent is defined as those with a specific degree or experience conferred by others, when onlyness points to inherent capacity. Those can overlap, of course but if you are the one to enable onlyness in your efforts, through systems and leadership, then you draw on the fuller potential of what exists.